Author contributions: Bevan KE, Mohamed F and Moran BJ reviewed the literature and wrote the manuscript; Moran BJ edited the final draft. Pseudomyxoma peritonei (PMP) is an uncommon “borderline malignancy” generally arising from a perforated appendiceal epithelial tumour. Optimal treatment involves a combination of cytoreductive surgery (CRS) with heated intraperitoneal chemotherapy (HIPEC). Controversy persists regarding the pathological classification and its prognostic value. Computed tomography scanning is the optimal preoperative staging technique. Tumour marker elevations correlate with worse prognosis and increased recurrence rates. Following CRS with HIPEC, 5-year survival ranges from 62.5% to 100% for low grade, and 0%-65% for high grade disease. Treatment related morbidity and mortality ranges from 12 to 67.6%, and 0 to 9%, respectively. Surgery and HIPEC are the optimal treatment for PMP which is at best a “borderline” peritoneal malignancy. Pseudomyxoma peritonei (PMP) is an uncommon clinical entity with an estimated incidence of one to two per million per year. Classically it is characterized by diffuse intra-abdominal gelatinous collections (jelly belly) with mucinous implants on peritoneal surfaces and the omentum. Many cases present unexpectedly at laparoscopy or laparotomy, or may be suspected at cross-sectional imaging during the investigation, or staging, of another pathological entity. Thus all who operate within the abdominal cavity will encounter an occasional case and will be faced with diagnostic and therapeutic uncertainty due to the rarity of PMP and the lack of an evidence base, or consensus, on management. PMP has generally been considered benign; however its behaviour suggests that it should, at best, be considered a borderline malignancy with disease progression over time, to massive abdominal distension and nutritional compromise in most cases. The long term survival in most patients remains poor with reported 5 and 10 year survival rates of 50% and 10%-30%, respectively. There has recently been a global interest in the management of PMP, particularly in macroscopic removal of tumour by complex surgical techniques combined with heated intraperitoneal chemotherapy (HIPEC)[4-14]. Werth in 1884 coined the term PMP, describing it in association with a mucinous tumour of the ovary. In 1901, Frankel described a case associated with a cyst of the appendix. Since these early reports there has been ongoing debate as to the primary origin of PMP, particularly in women. The exact incidence of PMP remains speculative. Both the clinical caseload experience of the two UK national centres (Basingstoke and Manchester), and a recent publication from the Netherlands reporting on a nationwide epidemiological and pathological database, suggests that the incidence of PMP is approximately two per million, per year. In reality the clinico-pathological entity “PMP syndrome” or “jelly belly” probably represents a spectrum of disease. This ranges from mucinous ascites, in association with a cystadenoma of the appendix (resulting in true PMP); to frank mucinous adenocarcinoma. Additionally intestinal mucinous tumours, particularly colorectal cancers, or indeed any mucinous neoplasm may present with clinical, radiological and pathological features resembling PMP. Most acknowledge that PMP predominantly originates in the appendix in men and increasingly evidence suggests a similar site of origin in females[17,18]. In women synchronous ovarian and appendiceal disease is common, and PMP appears more prevalent. However immuno-histochemistry and molecular genetic techniques support the hypothesis that in the majority of women, the ovarian tumour is metastatic from a perforated appendiceal mucinous tumour[19-22]. Recently MUC 2 over-expression has been suggested as a molecular marker for PMP of intestinal rather than ovarian origin. From a clinical perspective, Moran and colleagues[2,17] have proposed that it is unlikely that the male and female appendix behave in a different manner and it is likely that there are similar numbers of appendiceal PMP cases in both groups. Personal experience suggests that some of the reported increased female incidence may represent a “Will Rogers” phenomenon with earlier and more precise diagnosis in women. Women with non-specific symptoms are more likely to have cross sectional imaging, particularly to rule out ovarian cancer. The sequence of events culminating in PMP is thought to involve growth of an appendiceal adenoma progressing to occlude the appendiceal lumen with distension of the appendix by mucus and mucinous tumour cells. The appendix eventually ruptures, often initially by a “blow out” and subsequent slow leak of mucus containing epithelial cells from the adenoma. In most cases appendicular perforation is an occult event. The epithelial cells within the peritoneal cavity continue to proliferate producing large quantities of mucus. The tumour cell surfaces lack adhesion molecules preventing random adherence to peritoneal surfaces and, being surrounded by mucus, move with the normal flow of peritoneal fluid. The distinctive feature of PMP is its characteristic “redistribution” within the peritoneal cavity. In contrast to most carcinoma cells of gastro-intestinal tract origin that implant in a random fashion near the site of perforation; PMP demonstrates a nomadic pattern of migration with epithelial cells accumulating at specific abdominal and pelvic sites. The intraperitoneal distribution of PMP is determined by physical factors, namely the movement and absorption of peritoneal fluid and gravity. The open lymphatic lacunae on the under surface of the right hemidiaphragm and the lymphoid aggregates in the omentum, absorb fluid, leading to bulky accumulations as the mucus is absorbed and epithelial cells “filtered out” and concentrated. From a clinical perspective, the concentrated tumour masses result in “scalloping” of the liver and an “omental cake”. Gravity also plays a role, especially in the early stages, as mucus and cells concentrate by gravitational forces. Dependent portions of the abdomen and pelvis such as the recto-vesical pouch, the right retro-hepatic space and the paracolic gutters, accumulate tumour cells. As the disease progresses and becomes generalized redistribution extends to the left hemidiaphragm, engulfs the spleen and stomach, and spreads throughout the peritoneal cavity. The resultant gastrointestinal tract compression eventually culminates in bowel obstruction and terminal starvation. A pathognomonic feature of favourable PMP is the complete, or nearly complete, absence of tumour masses on the freely mobile intestinal surfaces, especially the small bowel but to a lesser extent the stomach and transverse colon. Normal peristalsis, together with poor adherence properties of the epithelial tumour cells results in “bowel sparing”. In contrast the parts of the gastro-intestinal tract fixed to the retroperitoneum, such as the gastric pylorus and antrum, the ileocaecal and rectosigmoid regions, are often heavily diseased and commonly require resection to remove macroscopic tumour involving the bowel. Smeenk et al recently made the important observation that there remains much confusion in the terminology of what exactly constitutes PMP. There is no debate when the abdomen is full of mucinous ascites originating from a primary appendiceal tumour. Other variations are more difficult to categorize, ranging from an unperforated mucocele, to local perforation with disease apparently confined to the pelvis or right iliac fossa, through to disseminated intra-abdominal disease. More than 50% of cases present before the full-blown manifestation of the disease. In essence a patient with a perforated appendiceal tumour with mucus, and/or epithelial cells, either on the serosa of the appendix or anywhere in the peritoneal cavity is at risk of developing PMP. Most cases will develop within 2-5 years of initial appendiceal perforation. Early on these patients are asymptomatic and disease is only detectable by cross-sectional imaging or direct peritoneal inspection at laparoscopy or laparotomy. For this reason a recent review outlined the management of an unexpected appendiceal tumour. It recommended a colonoscopy, to exclude synchronous colonic neoplasia, with a baseline computed tomography (CT) and tumour markers (CEA, CA125 CA19-9). Annual tumour marker measurements and cross-sectional imaging [CT or magnetic resonance imaging (MRI)] for 5 years were suggested. At any interval a laparoscopy should be considered if uncertainty exists (such as elevated tumour markers or a CT abnormality). Controversy persists over the classification of epithelial appendiceal neoplasms and their relationship to PMP. High grade colonic mucinous neoplasms, adenocarcinomas of the appendix and mucinous adenocarcinomas originating from any other intra-abdominal organ (particularly the colon) can mimic the clinical, radiological, and pathological features of pseudomyxoma peritonei . Additionally, there appears to be a spectrum of disease from low to high-grade, though the pathological appearances of the tumour may not correlate with its clinical behaviour. These difficulties in pathological classification of PMP have led to diverse reports with ongoing confusion as to outcomes following intervention. Thus, many series include all cases of PMP, of whatever origin, and include patients with mucinous adenocarcinoma of the appendix. Others report only on classical pseudomyxoma, from appendiceal low-grade tumours, generally cystadenomas. Ronnett and colleagues, in a retrospective review of a series of patients who had undergone complete cytoreduction by Sugarbaker’s group, reported a pathological system commonly quoted in the literature. They classified low-grade tumours as disseminated peritoneal adenomucinosis (DPAM) and high-grade tumours as peritoneal mucinous carcinomatosis (PMCA), with an intermediate group (IG) demonstrating a mixture of DPAM and PMCA. Survival was significantly higher in the low-grade (DPAM) as compared with the high-grade tumours (IG and PMCA). They were unable to show a statistically significant difference between the IG and PMCA groups and subsequently grouped these together[4,31]. Dichotomous categorizations of mucinous tumours of the appendix have been adopted by others and what is emerging is that optimal outcomes result from the management of PMP originating from low-grade appendiceal mucinous tumours[34,35]. These pathological classifications are important as they give some indication of prognosis following cytoreductive surgery (CRS) and HIPEC. Patients with low grade tumours (DPAM, MCP low grade etc.) appear to obtain maximum survival benefit from aggressive locoregional treatments while those with PMCA behave more like peritoneal carcinomatosis of colorectal origin[10,36]. The clinical presentation of PMP has been poorly defined due to few reports with large patient populations. The majority of patients are diagnosed during, or after, a laparotomy or laparoscopy, for suspected appendicitis, peritonitis or gynaecological cancer. In a series of 410 patients with appendiceal tumours, 217 had the diagnosis of PMP with histological confirmation. Overall, 27% presented with suspected appendicitis, 23% with increasing abdominal distension and 14% with a new onset hernia. In women, PMP was most commonly diagnosed during investigation of an ovarian mass (39%). Moran has recently suggested an increasing number being detected at cross-sectional imaging either for investigation of abdominal symptoms or incidental abnormalities noted on staging, or investigational imaging for unrelated pathology. CT is currently the optimal imaging modality for the diagnosis and staging of PMP. CT or ultrasound (US)-guided biopsy may be useful, although the relatively acellular material is often difficult to diagnose with certainty. CT-scan findings may be pathognomonic for PMP, particularly when radiologic techniques combine oral, rectal and intravenous contrast. Typical CT appearances include areas of low attenuation, with islands of higher attenuation due to solid elements within mucinous material. Classically “scalloping” of visceral surfaces, particularly of the liver and spleen (Figures 1 and 2), distinguishes mucinous from fluid ascites. 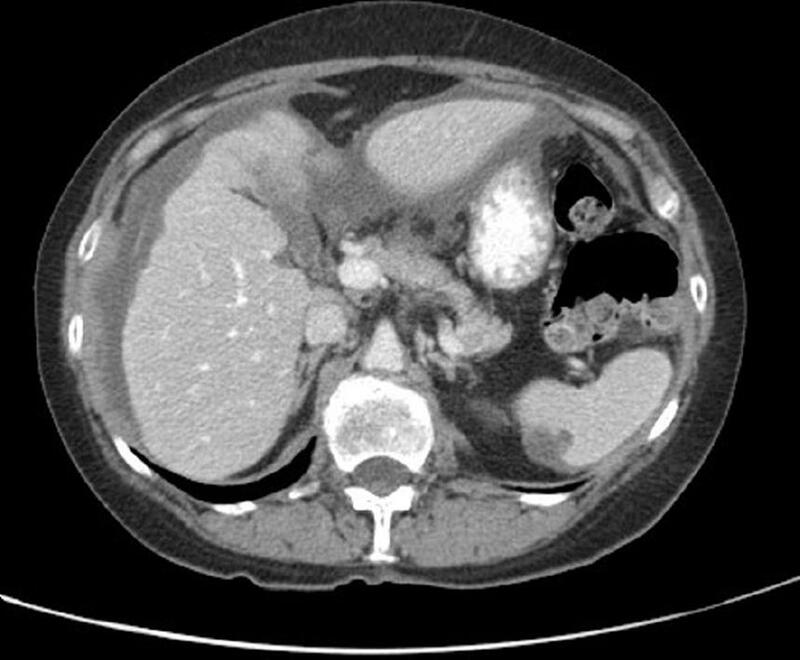 Figure 1 Scalloping of the liver and spleen on CT. Figure 2 Corresponding findings at laparotomy to CT findings shown in Figure 1. The pattern of disease distribution is characteristic and should suggest the diagnosis. Once PMP has involved the abdomino-pelvic regions, it fills those sites where peristalsis is limited by peritoneal attachment (ileocaecal region, ligament of Treitz, sigmoid colon) and finally occupies the remaining abdominal cavity. When the peritoneal cavity is completely or almost completely filled with PMP, CT-scan findings become less specific and the characteristic pattern of PMP cannot be appreciated. In most cases the striking feature is the relative sparing of the small bowel and its mesentery or “compartmentalization” in the central abdomen by a large omental cake and massive mucinous ascites. Contrast-enhanced CT can assist in predicting the likelihood of complete cytoreduction. Jacquet reported two radiological findings that predicted incomplete cytoreduction, segmental obstruction of the small bowel and tumour masses more than 5cm in width on the small bowel and its mesentery (exclusive of the distal ileum). With these findings on preoperative CT scans, patients had an 88% probability of incomplete resection and those without a 92% probability of complete resection. The role of MRI in staging PMP is under investigation. A recent report on the use of delayed gadolinium enhanced MRI seems promising in staging and patient selection for cytoreductive surgery but requires further evaluation. Positron emission tomography (PET) and PET CT are of limited value for low-grade mucinous lesions, though may be helpful in more aggressive variants by detecting systemic metastases. The prognostic value of tumour markers in patients undergoing CRS and HIPEC has been evaluated. Baratti reported that normal preoperative CA125 correlated to the likelihood of achieving adequate CRS on univariate analysis, and that increased baseline CA19.9 was an independent predictor of shorter progression-free survival on multivariate analysis. van Ruth et al reported that elevated CA19.9 after surgery, or rising levels during follow-up, related to disease recurrence. Survival was related to preoperative CEA and CA19.9 levels among 532 patients studied by Carmignani et al. Both markers, measured at the time of disease recurrence, correlated with survival after a second cytoreduction with HIPEC. Alexander-Sefre et al reported a significantly reduced recurrence-free interval for patients who had an elevated baseline CEA prior to complete cytoreduction, but also for patients with at least one elevated marker (among CEA, CA125 and CA19.9). When a patient presents with increasing abdominal girth as a result of presumed malignant ascites, the diagnosis is usually established with paracentesis, or laparoscopy and biopsy. If possible, paracentesis, or laparoscopy, should be performed through the midline as these sites can be excised by a midline abdominal incision. Ideally no lateral puncture or port sites should be used as this may result in abdominal wall tumour seeding, reducing the probability of disease eradication. Laparoscopic access and visualization may be compromised by disease extent, in particular a large omental “cake”, rendering accurate laparoscopic assessment impossible. The indolent behaviour of PMP led some to advocate no active treatment, although it is increasingly accepted that most patients with PMP, untreated, will progress to terminal starvation through intestinal obstruction by mucinous ascites. Traditional surgical management of patients with PMP involved repeated interval debulking for symptomatic relief, with limited expectation of long-term survival and no prospect of cure. The rarity of PMP has resulted in limited reports on accurate historical controls of uniformly treated patients. In 1994, Gough et al reported from the Mayo clinic, a 10-year survival of 32% in 56 patients who underwent serial debulking and selective, intra-peritoneal radiotherapy, or chemotherapy, between 1957 and 1983. In 2005, Miner et al reported a 10-year survival of 21% (12% disease free) in 97 patients treated by serial debulking, systemic chemotherapy and/or delayed intermittent intra-peritoneal 5-fluorouracil over a 22-year period in Memorial Sloan Kettering. Misdraji et al reported on 107 patients with a median survival of 7.5 years, and a 20-year survival of 25% after serial debulking and perioperative intra-peritoneal chemotherapy. The proportion who received aggressive locoregional treatment is not reported. Sugarbaker et al[51,52] introduced and popularized the approach combining CRS (aiming for macroscopic complete tumour removal) with HIPEC to address residual microscopic disease. Patients must be medically fit to safely undergo CRS with HIPEC. Patients with peritoneal carcinomatosis with an ECOG (Eastern Co-operative Oncology Group) performance score of 2 to 3 have significantly poorer overall survival after CRS and HIPEC, compared to those with an ECOG score of 1. The rationale for HIPEC is to target residual microscopic disease or small volume macroscopic nodules (ideally less than 2-3 mm in size). Sugarbaker et al published a series of 385 patients in 1999. Of these, 205 received HIPEC. Survival advantages in those who had complete vs incomplete cytoreduction (80% vs 20%) and in those with low-grade vs high-grade tumours (80% vs 28%) were reported but there was no report on the effect of the introduction of HIPEC. Glehen et al analysed the data from the same institution over a 30-year period and interestingly found a survival benefit for patients who had an incomplete cytoreduction with HIPEC in addition to Early Postoperative Intraperitoneal Chemotherapy (EPIC) compared with those who had no chemotherapy (27.2% vs 7.3% 5-year survival). However this comparison is likely to include a major selection bias in favour of those who had chemotherapy. Recent updates by Glehen et al reported a median survival of 156 mo, with 5 and 10 year survival of 72% and 55% respectively in 501 PMP patients. The majority (approx. 70%) had complete cytoreduction. The uniform treatment approach has shown improved 10 year survival, as compared with historical controls. No clear strategy exists for patients with disease not amenable to CRS, either at pre-operative assessment or intra-operatively, because of tumour extent and distribution, or serious co-morbidity, or age. There is increasing evidence that these patients benefit from a major palliative resection with reasonable intermediate-term survival of 43% at 2 years and 15% at 5 years and improved quality of life[8,54]. 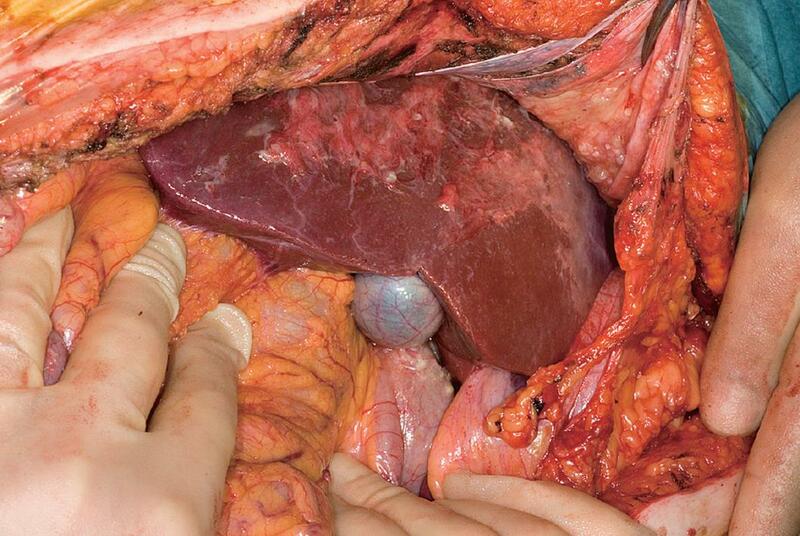 In these situations an extended right hemicolectomy, greater omentectomy and splenectomy with an ileocolic anastomosis, or alternatively a total colectomy and end ileostomy may be advisable. Glehen et al recommended a combination of comprehensive surgical debulking with HIPEC, except for patients with signet ring histology or lymph node involvement, in their experience with 174 patients who had incomplete cytoreduction. Mean operating times range from 6 to 12.6 h[6,12,56] and with such complex procedures morbidity and mortality are considerable. Major morbidity includes anastomotic leakage, enteric and pancreatic fistulation, pneumonia, thromboembolism, and intra-abdominal abscesses. Many patients have had previous abdominal surgery prior to definitive cytoreduction increasing the risk of complications from adhesiolysis and distorted anatomy resulting in a high incidence of small bowel fistulae and significant blood loss. Neutropenic sepsis is a potentially serious complication usually presenting around day 10 following intraperitoneal Mitomycin C, due to bone marrow toxicity. Septic complications may herald, or result from, neutropenia and require prompt treatment. Re-operation rates for postoperative complications range from 11% to 21% with mortality rates ranging between 0% and 14%. Median hospital stay range from 16 to 21 d[7,57]. Recent reports suggest that the initial high morbidity and mortality seen with CRS and HIPEC decreases with increasing experience[60-63]. This is most marked in specialized centres and includes improvements in patient selection, surgical expertise and postoperative management. Follow up depends upon the likelihood of recurrent or progressive disease and treatment options. A baseline CT scan 3 mo postoperatively, then 6 monthly, will facilitate detection of recurrence or surveillance of progressive disease[31,64], though we consider this over zealous. Baseline elevated tumour markers CEA, CA 19.9 and CA 125 may indicate an increased risk of recurrent disease in patients who are secretors. The author’s policy has been annual CT and tumour marker measurements, beginning one year after surgery, based on the hypothesis that very early recurrences are unlikely to be amenable to salvage. Elective second look surgery when recurrence, or progression, is suspected may be beneficial in selected patients. Esquivel and Sugarbaker reported a 5 year survival of 74% for patients with peritoneal spread of appendiceal malignancy treated with further CRS and HIPEC. Mohamed et al reported a 5 year survival of 70% from initial surgery in 45 patients treated with 3 or more reoperations. Yan and colleagues reported overall survival of 75% at 10 years from time of initial surgery following repeat cytoreductive surgery for both DPAM and non-DPAM. PMP is uncommon and generally originates from a perforated appendiceal tumour. The optimal treatment involves a combination of surgery and HIPEC. The treatment strategy is complex, associated with significant morbidity and mortality and a substantial institutional, and individual, “learning curve”. The long-term outcomes for CRS with HIPEC in PMP are impressive for patients with low-grade histology amenable to complete cytoreduction. Increasing numbers of medium to large case series reports reflect an improved awareness and understanding of the disease and a global recognition, and reporting, of the learning curve and outcomes. An emerging network of specialized centres may facilitate multicentre studies on aspects of chemotherapy type, duration and temperature to help allay the criticisms of many surgical, and in particular, medical oncologists on the lack of good scientific evidence in PMP management. All surgeons who operate in the abdomen will occasionally encounter a patient with PMP. In this unexpected event the best strategy to facilitate subsequent attempts at complete cytoredution is to take generous biopsies, remove the appendix if accessible and refrain from major resectional interventions. Following recovery and histological confirmation of the clinical diagnosis, an opinion should be sought from a specialized assessment and treatment centre.